YOUR PRICE INCLUDES: Meals (as noted above), group camping gear (as noted above), personal camping equipment (as listed above), remote food drop at Red’s Meadow, accommodations (as listed above), transportation to and from the remote trailheads from Fresno, CA, ferry crossing at Edison Lake, all applicable permits, professional mountain guide(s), pre-trip planning packet, and trip support from our friendly office staff. NOT INCLUDED: Meals while in the front country (noted above), alcohol, personal items, tips for mountain guide (10-20% of trip cost is typical), and optional trip cancellation insurance, which we always highly recommend. PREPARATION: Train for both strength and endurance. 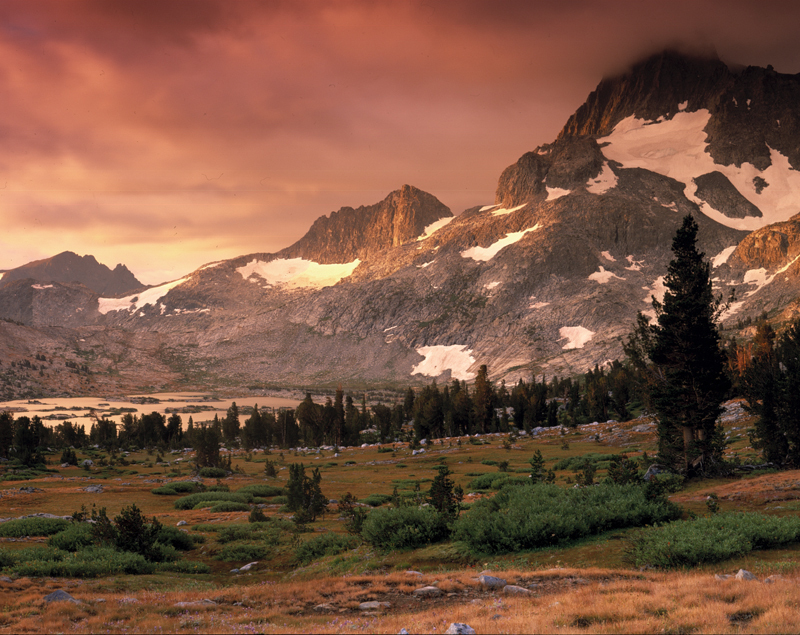 The John Muir Trail is a committing trip where you have set mileage to cover each day. It’s not about whether you can climb a high pass, but whether you can wake up 12 days in a row and climb a high pass (with a weighted backpack on) and still have fun doing it! To build up aerobic and cardiovascular endurance, we recommend the following training: carrying a weighted backpack on full day hikes, hiking stadium bleachers up & down, working on strength exercises and cycling. A training schedule of just running is not quite enough. Besides physical training, reading The Guide to the John Muir Trail by Thomas Winnett may also be helpful. Day 1: Your John Muir Trail Northbound trip begins by travelling to Fresno, California, and arriving at the Wyndham Garden Hotel Airport Hotel adjacent to the Fresno air terminal by 5:00 p.m. At 6:00 p.m. you will meet your guides for a trip orientation and briefing. We’ll also do a final gear check and discuss the details of the trip. Dinner is on your own at the hotel. Day 2: Meet at 7:00 a.m. after a hotel breakfast on your own. Our private shuttle will drive us about three hours to Florence Lake where we’ll start hiking. We’ll then begin the first leg of the trip, which starts with a ferry ride across Florence Lake (7,325') into the John Muir Wilderness. Today’s hike will be a mild 6.2 miles with a 400-foot elevation gain to the junction of the John Muir Trail. Day 4: Today’s hike is 11 miles downhill (except for a stout, but brief uphill climb of Bear Ridge) into the Mono Creek Drainage at 7,870'. Day 5: We’ll have another uphill day of 8 miles over Silver Pass (10,880') across the Silver Divide, named because of its silvery appearance. Note: The John Muir Trail is a very challenging route and the itinerary above reflects what fit folks who have been training specifically for the trip feel is a good pace without being rushed. That is, there will still be some time in the day to swim in the lakes or relax for a bit at camp in the evening with this itinerary. We just wanted to let you know that we had an absolutely spectacular trip with Nick. It was everything we were hoping for in experiencing the JMT. Nick was outstanding – he had us well organized, picked the best sites for camping, and kept us well fed!! Our thanks to you and to Nick for a great experience. A belated note from me and all the crew to say thanks for organizing and guiding a great trip on the JMT. Please pass on our huge thanks as well to Drew and Chris (and Lindsay in support) - we thoroughly enjoyed their company as well as their expertise. We all have many, many highlights and great memories from our ten days. Personally friends I've spoken with about the trip want to get over there and do it too. The good news is that we'll probably be back for the other half of the JMT soon, no joke! Thanks again to all you guys, have a safe rest of the summer trekking and we'll be back in touch someday. The JMT itself is extraordinary, but it was the coordination, organization and support by SYMG that really made this journey so good. That and a bloody good group to boot. Roddy, in particular was fantastic. He was not only an outstanding guide, with great trail and local knowledge, but he was a great ‘chef’, leader and friend along the way. Roddy encompasses all that a guide should be. He enabled the group to safely enjoy the JMT experience. He was strong (both physically and mentally), decisive when required, consultative, supportive, informative and always considerate of the group’s and individual’s needs. Nothing was too much trouble for him. Logistically he was also outstanding. This was particularly evident in his management of supplies and re-supplies. You should be very proud to have Roddy on your team. My thanks to all concerned, including yourself, Colby, Ryan, Drew and Alex for a great trip. We had the best time! We will certainly recommend SYMG to our friends and can't wait to get back and do a longer trip in the years to come. Melissa was an outstanding guide, chef and companion through the amazing backcountry of the Sierra. Just a marketing note--SYMG might be good for those who are just getting comfortable in the backcountry, but for those of us with lots of trips under our belts, it was even better.